Does your weekend start at 2.39pm today? 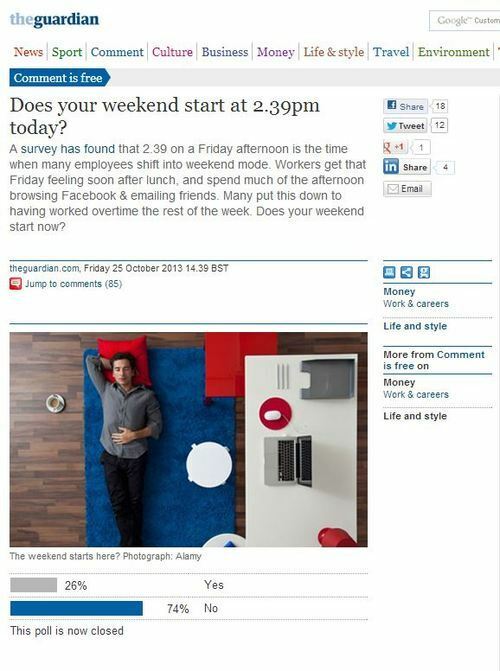 A survey has found that 2.39 on a Friday afternoon is the time when many employees shift into weekend mode. Workers get that Friday feeling soon after lunch, and spend much of the afternoon browsing Facebook & emailing friends. Many put this down to having worked overtime the rest of the week. Does your weekend start now? The Guardian, no less – a high-water mark for the world of Bad PR. Still, missing from the Guardian write up is the crucial point – the name of the company behind the survey. You may be waiting for the clock to tick round to 5pm today so you can leave the office. But in your head, the working week is already over by then. 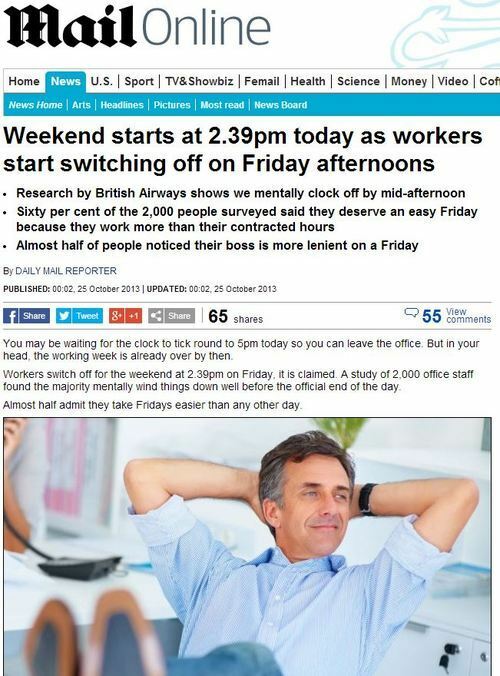 Workers switch off for the weekend at 2.39pm on Friday, it is claimed. A study of 2,000 office staff found the majority mentally wind things down well before the official end of the day. Almost half admit they take Fridays easier than any other day. The research, commissioned by British Airways, found the Friday afternoon wind-down often consists of using Facebook, arranging weekend plans and online banking. This entry was posted in Uncategorized and tagged british airways, daily mail, daily mail reporter, frank bond, guardian, robin glover-faure on November 6, 2013 by Michael Marshall. Women may claim that they desire spontaneity from their man, but a study suggests they actually want eight days’ notice of any “surprise” trip. 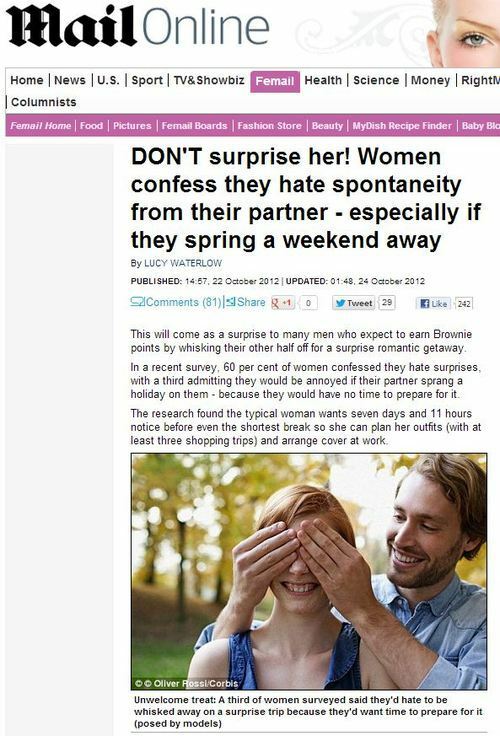 Three out of five women in the survey confessed to hating surprises and a third said they would hate it if their partner suddenly sprang a short break on them. 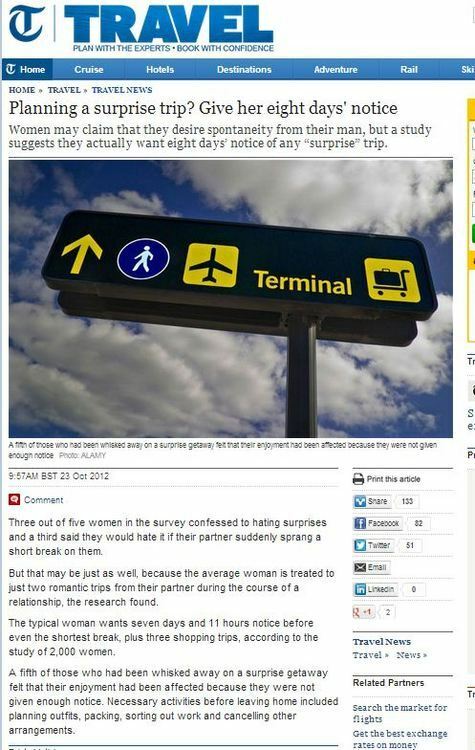 But that may be just as well, because the average woman is treated to just two romantic trips from their partner during the course of a relationship, the research found. This will come as a surprise to many men who expect to earn Brownie points by whisking their other half off for a surprise romantic getaway. In a recent survey, 60 per cent of women confessed they hate surprises, with a third admitting they would be annoyed if their partner sprang a holiday on them – because they would have no time to prepare for it. The research found the typical woman wants seven days and 11 hours notice before even the shortest break so she can plan her outfits (with at least three shopping trips) and arrange cover at work. This entry was posted in Uncategorized and tagged abigail comber, british airways, daily mail, lucy waterlow, telegraph on December 31, 2012 by Michael Marshall. THE average adult will travel more than 18,000 miles around the world by the age of 40 – nearly seven times as far as their parents. A study yesterday revealed the typical 40-year-old has been on at least 13 holidays abroad and 21 in the UK while their parents would have only visited five European countries, clocking up 2,653 miles. The average Briton will travel 18,324 miles by the time they reach 40 – almost seven times as far as their parents did by the same age. Researchers found that on turning 40, the typical adult will have been on at least 13 holidays abroad and another 21 in the UK. While today’s Brits are travelling to far flung destinations with their families, on average the previous generation travelled only as far as Italy. Research shows travellers today are becoming more and more adventurous, with seven in 10 choosing destinations where they can experience unknown cultures and sights. The same story also made, at least, the paper editions of The Sun and The Daily Star, as well as the paper edition of the Daily Mail. 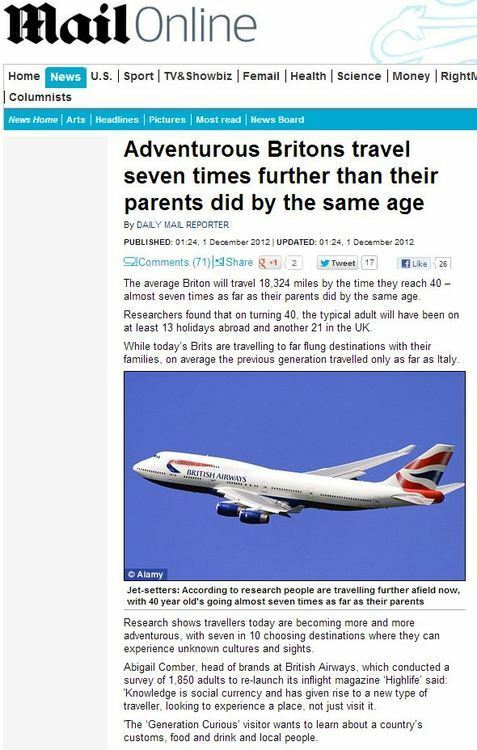 While it may well be true that people of the current generation travel more than their parents (in face it’s almost guaranteed to be true), as ever the source of the information is vital in figuring out why this research made the news. The poll by British Airways High Life magazine found travellers are increasingly adventurous, with seven in 10 choosing destinations where they can experience unknown cultures and sights. 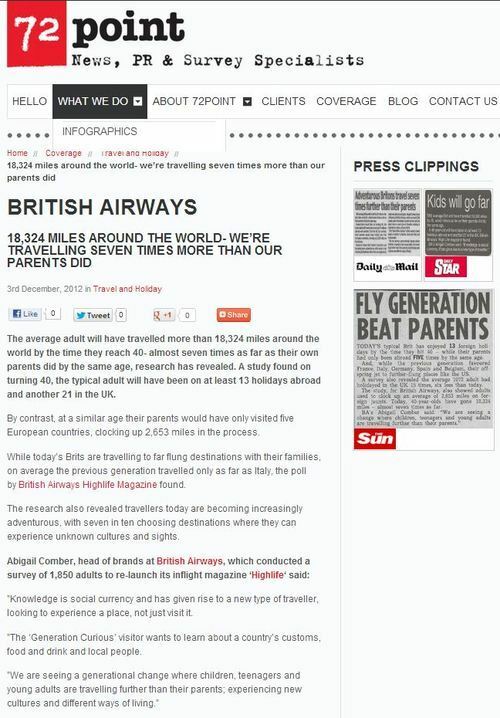 The research came from British Airways, who have something of a vested interest in promoting the fact that people travel by planes an awful lot. The research was carried out by polling company One Poll, part of the 72 Point PR company. 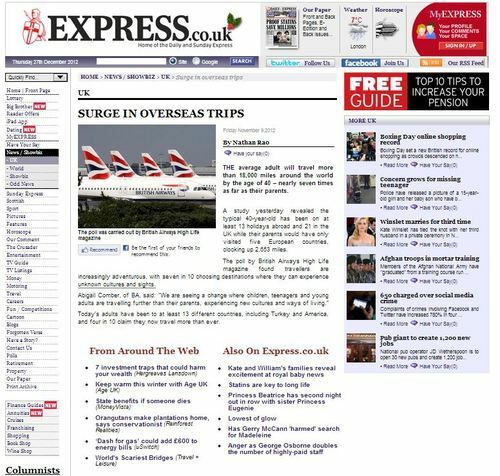 Looking into the press release fully, and it becomes clear what angle British Airways are pushing: ‘to be part of ‘Generation Curious’ you must be adventurous, and jet-set to far flung places of the world… and British Airways will take you there, including to our selected hottest places to travel in 2013’. The Churnalism rating? The Daily Mail article took 88% of the original press release, while Nathan Rao of the Express contributed barely a word, taking 78% of his short article from the BA press release. This entry was posted in Uncategorized and tagged 72 point, abigail comber, british airways, daily express, daily mail, daily mail reporter, nathan rao, onepoll, The Star, the sun on December 29, 2012 by Michael Marshall.